At Wild Terrains we believe in the occasional splurge-worthy experience. We’ll eat peanut butter and jelly all week to save for a fabulous meal, or spend weeks searching for cheap flights so we can spend a little more on a design hotel. Viña Vik in Chile’s Millahue Valley takes our philosophy to an entirely new level. Viña Vik is the definition of experiential travel – you’re staying on a private vineyard, picking grapes off the vine, learning how their wine is made, and noshing on gourmet meals straight from their garden, perfectly paired with wine from the very same vines you we’re sampling earlier in the day. A stay here is a sensory experience where your imagination runs wild. It’s justifiably heavy on the wallet (like, real heavy), but it’s an experience you’ll never forget. Viña Vik is the brainchild of Norwegian-Uruguayan billionaire Alexander Vik and his American wife Carrie. As wine enthusiasts, they decided 11 years ago they wanted to build a winery with one lofty goal: to make the best wine in the world. So, they hired world-renowned winemaker Patrick Valette and a team of oenologists, climatologists, geologists, viticulturists and agronomists (yes, this is serious business) to help them scout locations. They eventually found 11,000 acres of land in Chile’s Millahue Valley, about 2 hours south of Santiago. After weeks of analyzing the wind, temperature, and water on the property, they purchased the land and began plotting their viticulture venture. The area is perfectly situated between the Pacific Ocean and the Andes Mountains – cool Pacific breezes move across the property to the east in the mornings, hitting the Andes and then coming back to cool the vines in the evenings. While this may sound like an intimate operation, don’t let the description of Vik Winery as family-owned fool you. The Viks have a massive operation with a team of scientists, botanists, and winemakers working in labs and along the vines to ensure they are producing the highest quality wines possible. Patrick Valette has since become the winery’s CEO, Cristian Vallejo is the lead winemaker, and Hector Moya is the head sommelier. We rent a car in Santiago and drive 2 hours south to get there. As we approach the property we can see the hotel from far away. It’s hard to miss. Uruguayan architect Marcelo Daglio designed the building to be a stark contrast to its surroundings. Open-air and up on a hill, it has a titanium gold roof that mirrors the patterns of the mountain ranges surrounding the property. It would be perfectly at home in a James Bond film. The hotel has only 22 rooms and no two are alike. In many ways a stay in these rooms feels like you’re sleeping in a private art exhibit – and, well, you are. The Viks worked with artists to design each room – handpicking or commissioning every piece of art or furniture in the hotel. In the Azulejo suite, the Viks asked a small artisanal company in Portugal to design hand-painted blue and white tile murals for the walls and ceiling. The tiles were individually numbered and shipped to Chile to be assembled by the Vik team in a paint-by-numbers fashion. Another suite’s bathroom is covered in copper coins that had to be carried to Chile in Carrie’s suitcases. To say designing these rooms was a labor of love would be an understatement. The Viks place a lot of importance on creating a fabulous experience for their guests so full-board is the only option at Viña Vik. That means all of your meals and activities are included in your nightly rate and it ensures you get the full experience while you’re here. On top of that, they actually have an Experience Manager named Juan to make sure every aspect of your stay is top-notch. Juan greets us as we pull up to the front steps. A quick chat with him and we are checked into the Gabler’s Grisaille suite designed by artist Alvaro Gabler. Juan sets up a tour of the winery for us later in the afternoon, followed by a wine tasting in the Vik barrel room. It’s lunchtime, so we head to the restaurant in the back of the hotel and choose a table outside on the patio looking over the stunning infinity pool and view of the entire property. It’s breathtaking. Chilean chef Rodrigo Acuña Bravo focuses on serving only locally grown and sourced food. Lunch is served family style with a glass of Vik’s Milla Cala wine. Today that means freshly baked bread with mushroom butter, a choice between white fish caught in a nearby seaside town or grass-fed steak from a local farm, with a cauliflower puree and mustard seeds, fettuccini pasta tossed in an avocado and herb pesto sauce, and roasted vegetables from the Vik gardens. 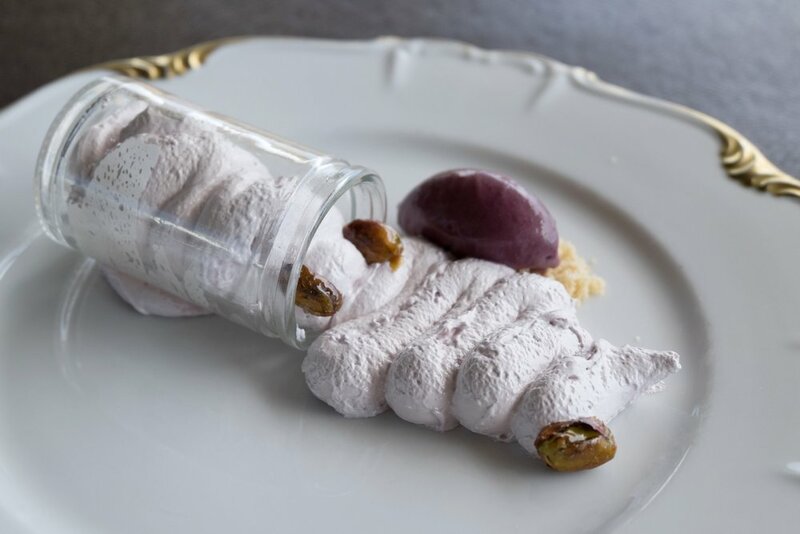 For dessert, a wine-infused mousse with blueberry ice cream & candied pistachios. It’s the best meal we have in Chile. After lunch, we hop in a car with Jama, an apprentice at the winery right now. He takes us to a section of Cabernet Sauvignon vines and explains how they do things at Vik. One way to make sure you’re producing the best wine possible is to keep your standards exceptionally high. At Vik they’ve mapped their entire property by microclimate and planted each grape according to where it grows best. Across the property, there are weather stations that monitor climate changes and high-tech irrigation systems to ensure the vines are properly hydrated. They also practice green harvesting, where they cut off lower-quality or struggling vines to drive more nutrients to the higher quality vines. After all of that, they only harvest about 30% of the grapes they grow. To minimize waste, they let neighboring winemakers harvest the other 70% that don’t meet the standard for Vik Wines. To control quality, the Vik team only harvests at night when the grapes are coldest (cold grapes are easier to de-stem than warm ones and harder to damage with handling). From the fields, Jama leads us to the actual winery, which was designed by architect Smiljan Radic and his wife Marcela Correa. The winery is energy efficient and blends into the natural terrain to have minimal impact on the landscape. The entrance to the winery feels like an art museum with shallow pools of water and scattered rock sculptures. The pools, called El Espejo de Agua (The Water Mirror), have a pretty important energy impact on the building. Underneath the shallow water is a layer of metal that cools as the water evaporates off the surface during the day. Underneath that metal is 6 feet of concrete, which also cools as the metal cools. Finally, underneath the concrete is Vik’s barrel room, which is kept at a cool 57°F through this process without ever needing any air-conditioning (smart, huh?). The Viks were the second team in the world to have a Butcher Delta R2 Vistalys - an optical sorting machine that learns the size, shape, and water content of an ideal grape and ejects grapes from it that don’t fit the bill. They’ve also got a machine that mechanically de-stems the grapes and slices their skin open the slightest amount so that gravity can do the rest of the maceration. And that’s just the processing equipment. In the bottom of the building, there are labs filled with nerdy wine-enthusiasts that spend their days staring at maps and scientifically analyzing how well they are making wine. It’s a production to say the least. And while all of this might seem a bit extreme, it seems to be working. We taste a few of their wines including the VIK 2011 and we are believers. We are also excited that every guest gets a bottle of VIK 2011 to share over dinner. After the tour, we head back to the hotel for some relaxation time in the amazing tub in our bathroom. No detail is spared. There’s even a jar of wine-infused bath salts begging to be used. A long wine-filled dinner is next, followed by a short trek away from the hotel lights to see the stars. Because we’re in the Southern Hemisphere we can see the Milky Way and it’s like the Viks orchestrated that for us, too. We go to bed feeling doused in luxury and can’t wait for another day. In the morning, we wake up early to a very bright sunrise. We have the option of going horseback riding or hiking, but we linger in bed just a little too long. We finally make it to breakfast and our eyes are bigger than our stomachs after so much delicious food the day before. We sip on strong coffee as we pick at buttery homemade croissants dipped in dulce de leche, perfectly seasoned fried eggs, and fresh fruit. After breakfast, we head down to the pool and soak up some sun from the lounge chairs. We think, "We could get used to this." Viña Vik. Full board rates for two people start at $850/night. Full board includes private suite, all activities, all meals, a glass of Milla Cala with lunch and a bottle of VIK 2011 with dinner. Amenities include infinity pool, spa, yoga room, gym, & game room. Book here.